Comets are fascinating objects. At their best, they can be spectacular objects in the sky, with beautiful tails pointing away from the Sun. Deep-time astrophysicists believe that comets were formed at the time the Solar System was formed, which they believe was 4.5 billion years ago. However, there is a problem understanding the existence of comets within a deep time paradigm. This is because of the comets’ tails which only appear when the comet is close to the Sun. The tails are caused by particles from the comet nucleus being evaporated by the Sun. This clearly means that some of the comet’s material is lost as its orbit reaches the closest point to the Sun. The amount of material lost is not insignificant. After about 10 million years, there should be no comets left. As creationists believe the Solar System is only 6,000 years old, this is not a problem for us. But evolutionary astrophysicists cope with this difficulty by suggesting that there is a cloud of comets, circling beyond the edge of the Solar System, and that every so often an object may nudge these Oort comets into closer orbit around the Sun. New Scientist magazine says of this Oort Cloud, “We can be quite confident the Oort cloud exists even though we have never actually imaged an object.” We can’t see it, but we know it’s there! This, unfortunately, is the length that people have to go to when they do not want to start with the truth of God’s word. Thank You, Lord, that You care for us. We look at the universe and wonder how You could care for such as us, but Your word tells us that You do, so we are thankful. Amen. Ref: The Oort cloud surrounds our solar system – why can’t we see it?, March 16, 2016, , accessed 10/27/2017. 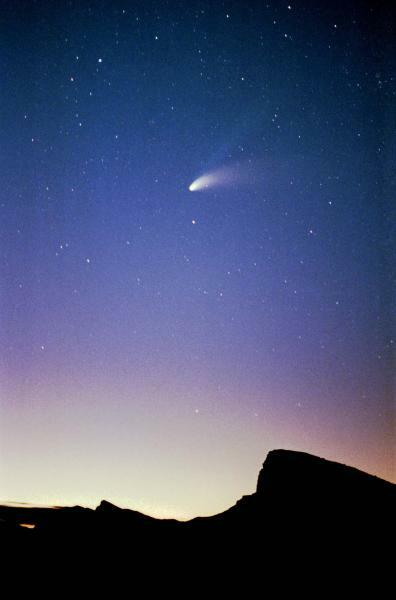 Image: Comet Hale-Bopp at Death Valley; License: Creative Commons Attribution-Share Alike 3.0 Unported.